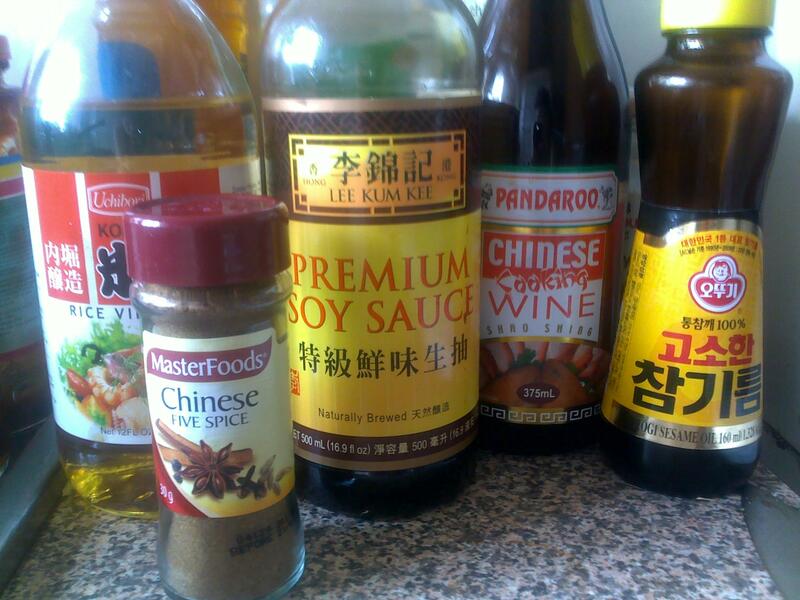 Below are some really easy Chinese inspired dishes I cooked recently for a big dinner. There were no leftovers which I took to mean it went down well. 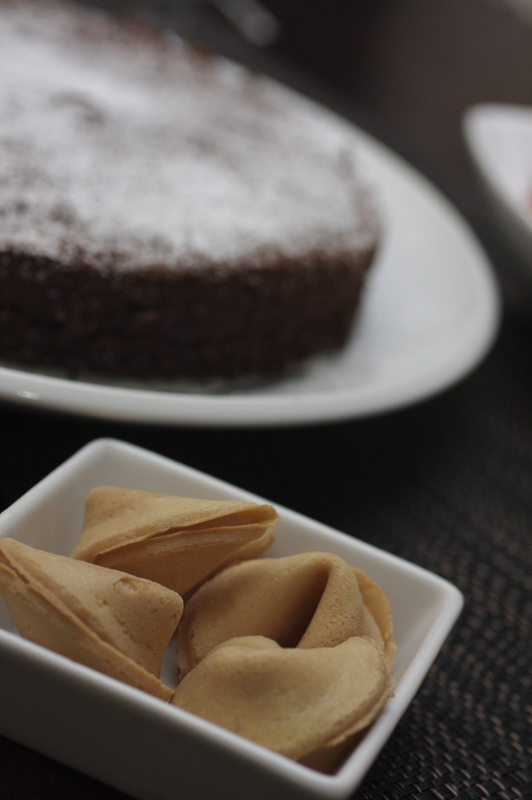 Or maybe I didn’t cook enough…anyway here they are if you want to try them! 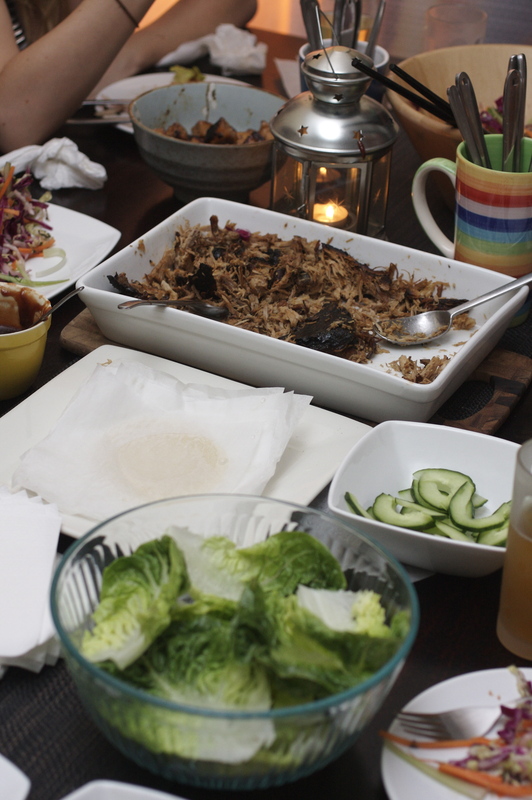 The main event - The Chinese pulled pork served with lashing of hoisin, pancakes, lettuce cups, cucumber, spring onion and Asian slaw. I remember my very first Chinese. It was at Furama in Dublin. 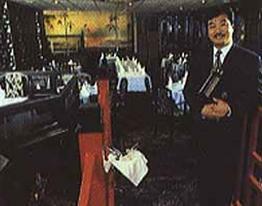 You had to ring a doorbell to enter the sleek black restaurant where there was a curved bridge over a water feature full of goldfish – I was impressed! And that was before I’d had a belly full of new and exciting flavours. Furama in the 90s - the beginning of my love affair. With the food, not him. Chinese food still impresses and amazes me but also scares me a little – all that feng shui like business of balancing the sweet, sour, bitter, salty and most of all the mysterious umami can be off putting but once you have a few store cupboard essentials and are prepared to taste, taste and taste again you can replicate some of those oriental flavours at home. I had the pleasure of having a whole day to work on this but if you are serving it for dinner most of the dishes can be prepped ahead – in fact getting the pork marinating the day before would be best and the slaw tastes better the longer it is soaking in the vinegary syrup. These are a take on a dish cooked by Lisa Allen on Great British Menu. They were so easy to do and turned out to be such moreish delectable morsels that I will definitely be doing them again. Chop your chives, onion and then prep your prawns removing the head, shells and yucky black bits so you are just left with clean juicy flesh that you must then mince up as finely as you can with a sharp knife. Add the prawns, chives and onion to your butter and then blitz with a hand blender. Now for the bread – remove the crusts and then you need to flatten it out as much as you can. I used a pasta machine which makes this really easy but otherwise you can do it with a rolling pin. Melt the remaining butter and then you can start to make your toasties. I put a generous smear of melted butter around the edges of the bread, a teaspoon of the prawny butter in the middle, squashed it a little but not to the edges and then folded over the bread into a triangle. Then I lobbed on some more butter and tided the edges with a pastry crimper. 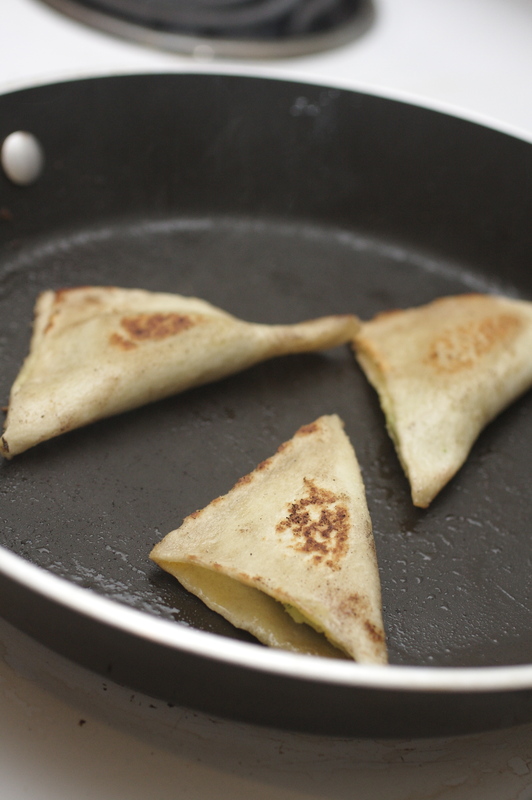 They should look like mini toasted sandwiches. Spinkle them with a little Chinese five spice and then wrap them up until you are ready to cook them or cook them – just fry them in a pan with a little butter or oil for a minute on each side or until they are golden and crispy and season them with some salt. If you want to them a little ahead they should hold well in a warming oven (90c) for about 20-30 mins. Serve and watch everyone smile…. These are an easy crowd pleaser best served hot and sprinkled with whatever green herbs you can throw over them and some lemon wedges. Oh and don’t forget some dipping sauces…I made Chinese Maire Rose sauce using Kewpie mayo, ketchup, paprika, Chinese five spice, shaoxing and lemon juice. 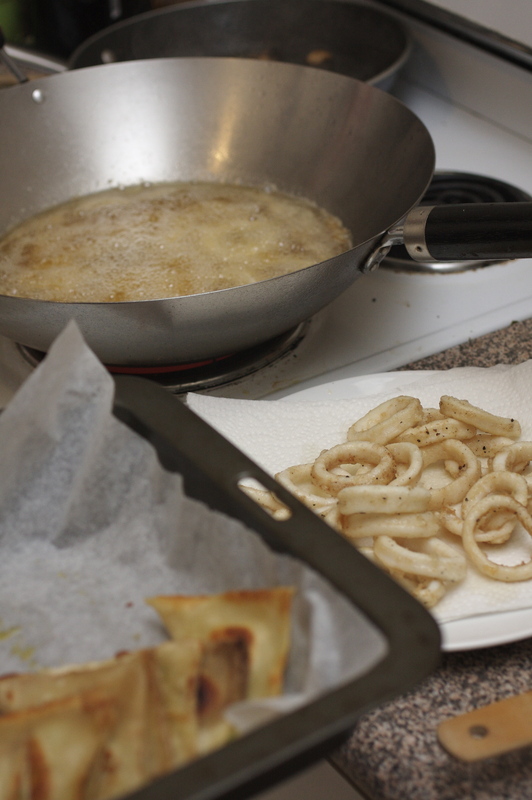 Put your oil on in a wok over a high heat – we’d just done some prawn crackers so it was nice and hot. In a bowl or even better a big zip lock bag, mix self raising flour, oil and a little water to make a paste. 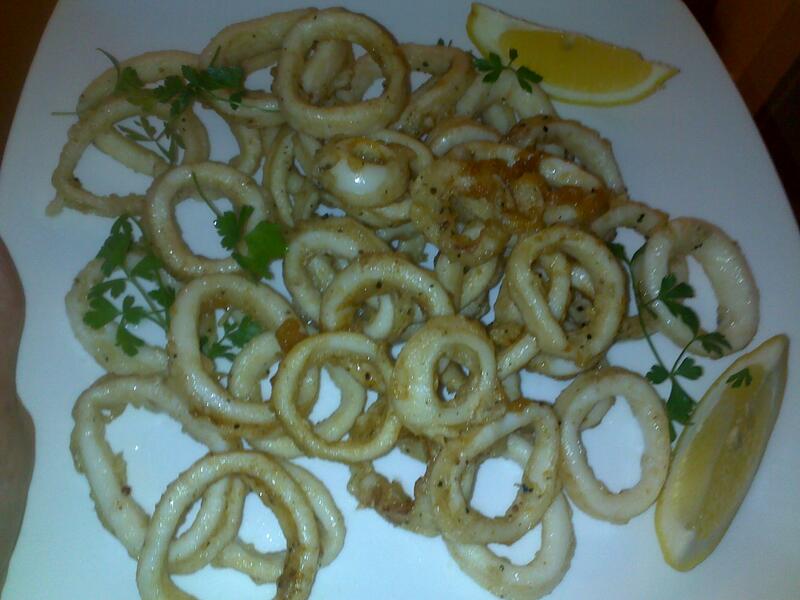 Add your squid rings and coat themin the paste then sprinkle each piece with cornflour until they get a bit dry. Then you need to add the salt and pepper and that’s pretty much it. Your oil should now be nice and hot (I test it by dropping a piece of rice and it should sizzle and float straight to the top) and you can start to fry your squid in batches and cook each batch for only about a minute or so, no longer – you want them just crisp on the outside and still sweet and tender within. Remove to plates lined with kitchen towel. Serve with some chopped herbs, squeeze of lemon and some dipping sauces and devour. Buns/ pancakes of some sort – ideally Chinese folding white buns, I couldn’t find these so we used steamed gow gee wrappers instead but you could use small white dinner rolls too. Depending on your cut it’s probably beneficial to marinate your pork for a few hours or overnight it you can. But you can also just rub it on before you cook…if that’s the case then preheat your oven or your barbeque to about 220c. 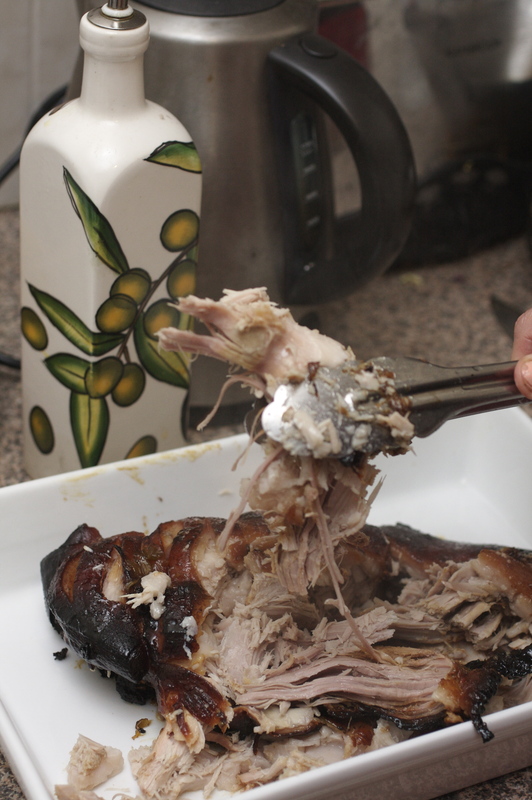 Get your pork into your cooking dish – it’s probably best to use a disposable foil tray for this otherwise there will be a lot of soaking elbow grease involved in the washing up! Using a really sharp knife score the skin anyway you can, it’s good to have some slits to put your ginger and spring onions into and it makes it a little easier when it comes to breaking it all up when it’s cooked. Mix together your rub ingredients and set aside about 1/3 of this for later, then rub the rest all over your pork. Scatter your sliced spring onion and ginger over your pork and pour some water into the bottom. Cover with parchment paper, then wrap in foil and leave to marinade or put it on your oven or your barbeque. After 10 minutes turn your temperature down to 150c and then leave to slow cook for 3-4 hours. Check on it every half hour or so and add some liquid each time – I used water, white wine, shaoxing, what ever was closest at the time! After this I took the covers off, poured the rest of the mix over it and left it for another half hour or so in the barbeque. It should be soft and ‘pully’ by now so you could serve it straight away but I had late guests so I pulled it and put a spoon of the marinade through and kept it in a warming oven for about 30 minutes until we were ready to eat. Pulling is easy (well this kind is!) just break it up with tongs or whatever is handy and then pull the pieces by sticking a fork into them and shredding the meat into pieces with another fork. Serve to a hungry gang with some sliced cucumber and spring onions, plenty of hoisin and pancakes or buns or lettuce pile your pork into. YUM. This is too easy and it also cuts through the fattiness of the pork and the sweetness of the hoisin really well. Put the sugar and vinegar in a pan over a gentle heat until the sugar is dissolved. Take it off the heat and leave to cool. 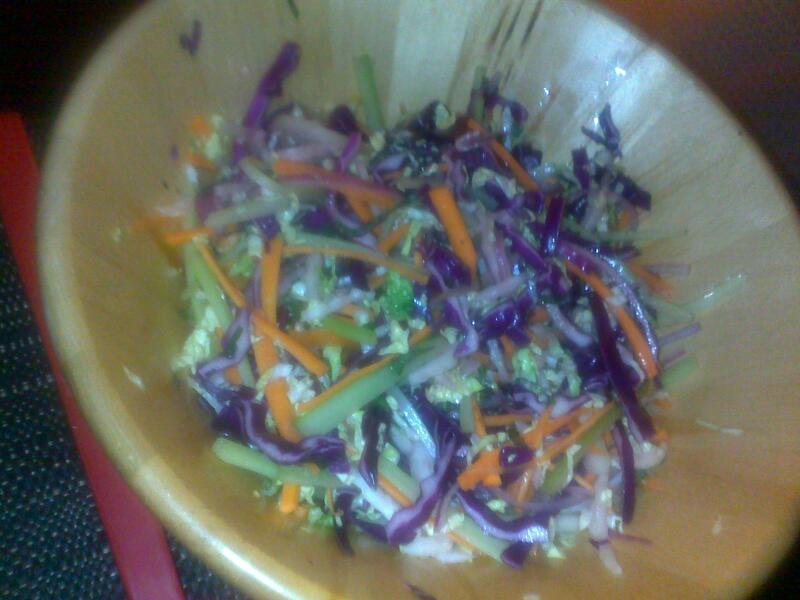 Slice all your slaw stuff and put in a big bowl. When the dressing is cooled pour it over and make sure all your lovely vegetables are coated in the sour dressing. Leave in the fridge until you are ready to serve. Ali, this looks super – it is after making me STARVING! And now I’m off to the canteen for a stale bread and plastic ham sandwich, yum.